The Books below can be purchased via online retailers such as Amazon and Barnes & Noble. Take a first hand look at the dedicated adversary tactics units within the U.S. Air Force, Navy and Marine Corps. Every unit in this highly specialized group, from the Navy's well known TOPGUN program to the US Air Force's elite 414th Combat Training Squadron is reviewed. The Marine Corps Sniper squadron and Navy reserve units are also covered. 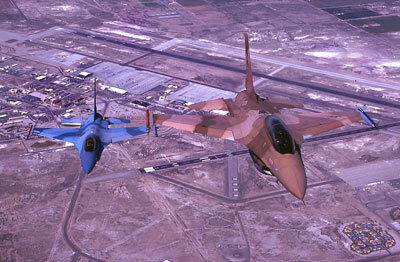 Fly with the best air combat training units anywhere in the world. Strap into USAF F-16 Vipers, Navy F/A-18 Hornets and Marine F-5E Tigers during actual training missions. Hear directly from actual aggressor pilots as they describe what it's like to simulate the bad guy. Learn how they fly their 'Soviet fighters' against American airman in mock air battles. 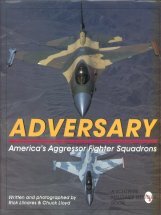 Adversary covers the history of the adversary programs in the American military as well as exploring the current air combat environment Modern threat aircraft flown by the former Soviet Union as well as the three American aggressor fighters are also included. Playing the role of the 'bad guy' in the dangerous environment of aerial combat is not an easy task. Adversary pilots are superb fighter pilots and also excellent teachers of the art of air combat, masters of their trade. Their job is to teach, to take the best fighter pilots in the world and make them even better. Adversary tells their story in dramatic photography and fascinating text. Description - 192 plus pages, 180 full color photographs, 10" x 10" hardcover book. Published by Motorbooks International Inc.
Not many military commands enjoyed the widespread popularity and exposure that the Navy Fighter Weapons School (NFWS) did with the 1986 movie TOPGUN. The blockbuster film made the F-14 Tomcat, the NFWS and a relatively unknown young actor named Tom Cruise all famous. A great deal has changed the past twenty years especially within the former NFWS. Modern air combat, particularly the brand the U.S. Navy deals with has gotten more complex. 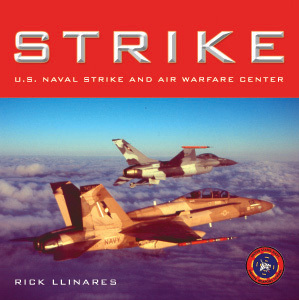 STRIKE takes an inside look at the current Navy Strike and Air Warfare Center. With over three years of research, hours of interviews and many actual flights, Rick Llinares takes you into the briefing rooms and cockpits of the world's best pilots. Cruise along in F-14, F/A-18 and F-16 fighters during actual TOPGUN missions. Get down in the weeds with TOPGUN SH-60 Seahawk helo aircrews as they conduct combat search and rescue missions. Every facet of modern tactical naval aviation is covered in this detailed, richly photographed book.